The wild landscape of Namaqua West Coast truly reveals itself best when you sit quietly and simply observe. It is then that the rich variety of West Coast birds and animals, including those in the ocean, becomes apparent. 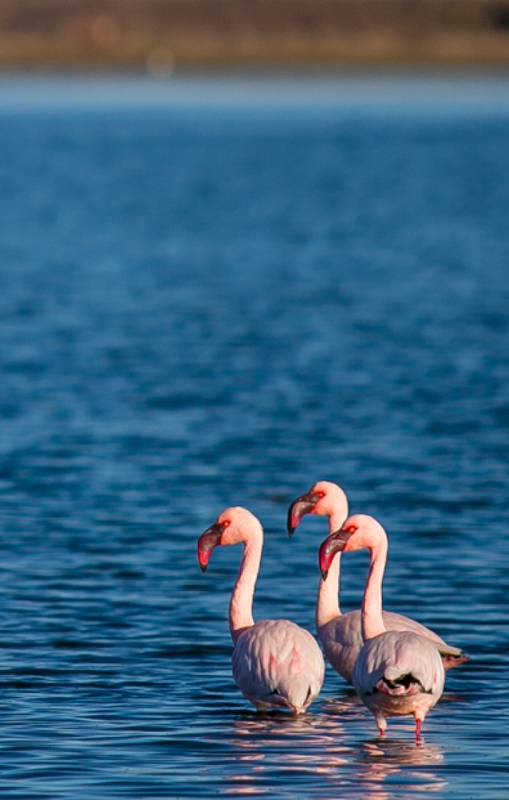 The Flamingo Birding Route is one of the region’s little-known treasures that incorporates excellent observation sites in mountain, coastal, sandveld and estuarine habitats. The greatest concentration of birds can be found within the Olifants River estuary, an important habitat for thousands of migratory birds. More than 200 bird species have been recorded here, and in summer the estuary’s bird population can swell to over 15 000 individuals. Lesser and greater flamingo’s, African marsh harriers, African black oystercatchers, Caspian and swift terns, Hartlaub’s gull and Curlew sandpipers can all be seen in significant numbers. Rare migratory waders such as common redshank, pectoral and broad-billed sandpipers, red-necked phalarope and dunlin also frequent the estuary. The Olifants Estuary has been classified as the fourth most important South African Estuary in terms of Estuarine Conservation. The estuary is permanently open, thereby creating a unique ecosystem for birds, fish and botanical importance. It is 36km long to the low water bridge of Lutzville. Salt marsh vegetation is highly threatened by anthropogenic impacts and this has knock on effects on the rest of the estuary functional zone. The Olifants Estuary has the largest supratidal and floodplain salt marshes in South Africa. More importantly they are still in very good shape and are the only good representative of salt marshes along the West Coast. River walks along the Olifants River provide the best birding opportunities and there are bird hides near Papendorp. A large number of endemic bird species are also supported by the succulent Karoo vegetation of the Knersvlakte. The Varsch River, 14 km north of Vanrhynsdorp, is a good birding area with frequent sightings of Namaqua sandgrouse, various lark species, mousebirds, chats and warblers. Ludwig’s bustard, secretary birds, blue crane and korhaan are often spotted on the Knersvlakte, as well as raptors such as the jackal buzzard, Verreaux’s eagle and the African harrier hawk. Black eagles are sometimes seen in the mountains east of Vanrhynsdorp. Farm dams across the region are good for spotting maccoa and yellow-billed duck, SA shelduck, and Cape shovelers. The Olifants River Valley is one of South Africa’s most extensive farming regions, located in what is also one of the country’s most arid territories. Located 300 km north of Cape Town, the producers along the Olifants River thrive almost exclusively as a result of an extensive irrigation system with a fascinating history. The construction of a canal that is the heart of this system is a story of determination, tenacity and skill. Undeterred by the harsh climate and inhospitable land, pioneers in the early 20th century built the canal by hand. They also built it at an exact ratio of decline over a vast distance so that the water moves exclusively by gravity, from start to finish. Today, the main canal extends for 260 km and has side-branches totalling a further 60km. It supplies water to the Bulshoek Dam near Rondeberg, as well as to farmers from Koekenaap to Ebenhaeser. In an area with an average rainfall of only 160mm/year, water allocation from the canal is spread over 15 000 ha of land. Vineyards were already planted in the 18th century in the Olifants River Valley because in 1804 more than 42 000 vines were recorded. Wine and brandy were being produced. Disease, heavy taxes and red tape however meant this industry was reduced to just 5000 vines in 1824. Grape farming picked up again however so much so that in 1904, vine records showed 349 000. The establishment of the Olifants River irrigation scheme in 1924 radically changed the shape and form of agriculture in the valley and sparked phenomenal growth and development. Agricultural production initially focused on the available mudflats exclusively and as a result of the water shortage and the fact that higher lying drier bank could not be cultivated without heavy machinery. There were also distribution problems that were resolved in 1927 with the arrival of the railways and the ensuing linkage with Cape Town. Some 11000 ha under irrigation in the Olifants River irrigation area in 1990 were roughly 7000 ha, in other words 63,3% under vineyard. The rest comprised vegetables and lucerne. Currently, canned tomatoes, beans and to a smaller degree market tomatoes and potatoes after vineyards, the most important farming types. Although lucerne is also grown, it is only used as a filler crop to help prepare for vine plantings. Nearly 2,5 ha English cucumbers are produced by seven producers using tunnels. Raisin production has been a popular farming occupation between the late 30s and mid-1950s along the Olifants River at Vredendal. Raisins were sent directly by rail to the SA Dry Fruit Co-op in Worcester. There are numerous raisin companies in the area today that buy in produce from the farmers. There has also been a large development of table grapes, primarily in the Trawal, Klawer and Vredendal areas. The Hardeveld is comprised mainly of sheep farms and the Matzikamma mountains and the area around Vanrhynsdorp produces high quality Rooibos.